The Seattle-based artist uses climate sensors, termites and thousands of people to create his nature-inspired sculptures. His giant tree artwork, Middle Fork, will be on show at the Annual Meeting at Davos this month, thanks to a joint collaboration with the Smithsonian Institution and World Economic Forum. 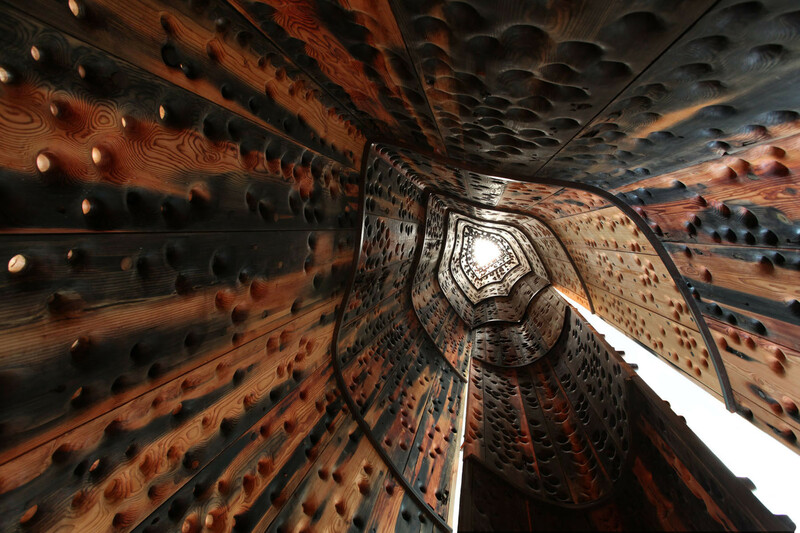 More than 2,000 people have worked on the enormous wooden sculpture – which, after its exhibition at various venues, will be returned to the forest and allowed to disintegrate. Installed amid the bustle of the conference centre in Davos, what thoughts and feelings does Grade hope the installation will inspire among government ministers, scientists and business leaders? It’s not the only artwork of Grade’s to highlight our connection to the natural world. Past projects have been designed to be eaten by insects, picked apart by birds and rearranged by wild boar. They have involved climate-measuring sensors and kinetic elements harnessing electromagnetic fields. Inspired by a type of single-cell marine plant drifting in the upper layers of the ocean, this walk-through art installation opens and closes as it pulses with interior light. Each fluted curve in the sculpture represents one of these carbon-dioxide-eating coccolithophores, as they photosynthesize light and cool the planet. These entirely biodegradable sculptures – made form methylcellulose-and-corn-based plastic – were exhibited in Brighton, England, in a deconsecrated church. At the end of the exhibition, they were carried through the city’s narrow lanes by hundreds of people and deposited on the edge of the English Channel, where they dissolved in the waves. The sculpture, made from the hull of a salvaged wood schooner built in San Francisco in 1897, is a lofty 65 feet high, weighs 11,000 pounds, and punctures the floor and ceiling of the history museum it’s installed in. The portions of the sculpture that protrude above and below the building will gradually wear away, while the main body of the work inside the museum will be preserved. 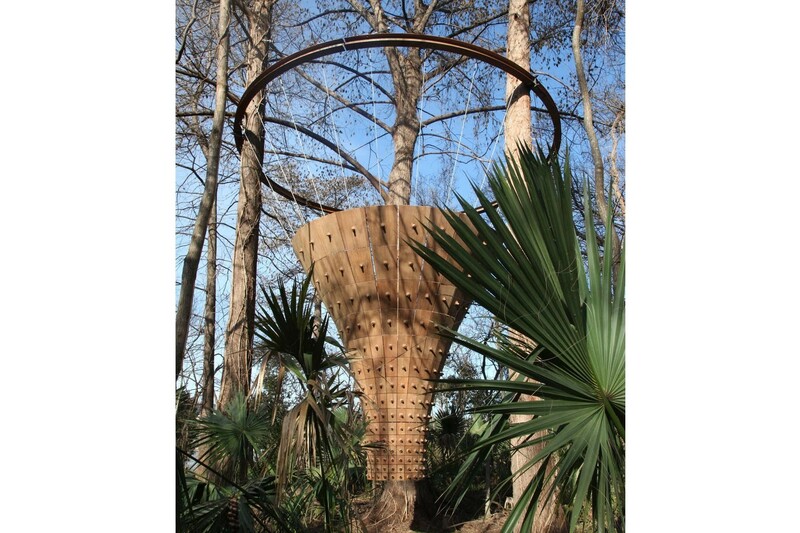 Suspended just above the ground, hanging from trees, this hollow fluted-wood form is 16 feet high. When strong winds move the trees’ canopy above, the top of the sculpture contorts into an ellipse, while the lower section remains still. Viewers can stand safely inside the base of the sculpture, and gaze up at a framed, changing view of the canopy above.